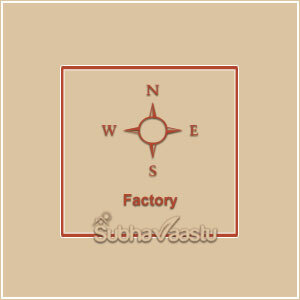 Factory Vastu | Plant Vastu: In many areas factory may be called as Mill, Kharkana, Industry, Small-scale Industry, Plant, Manufacturing shed, Workshop etc. Irrespective of the size of the factory, manufacturing plant, or any manufacturing entity applying Vastu Shastra principles in the construction of the same is hugely helpful in avoiding problems with administration, financial stringency, labor problems and the like. To reduce headaches, its advisable that one may construct the property with Vastu principles, if the property may be built with Vaastu rules then it may protect owner. 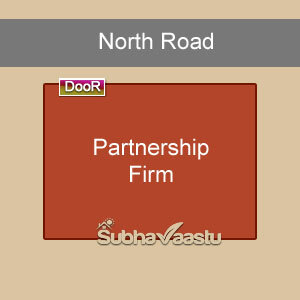 Factory Vastu and Office in Factories: Offices such as Chairman chambers, CMD chambers, Managing Directors/Partners and other important functionaries, placement of incoming raw material stores, finished goods stores, dispatching room, security personal rooms apart from main manufacturing plant, canteen, pantry of senior officers etc are to be placed appropriately for effective results. All the above are the features which one can take care of within one’s own premises. It should not be belittled that the very site and placement of the factory vis a vis the neighborhood is equally important if not more. The best time to consult a vastu specialist is even before finalizing the site for the construction of the manufacturing plant. 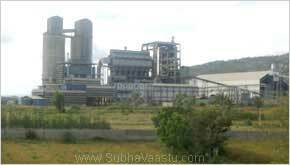 While buying the plot for constructing the factory, concurrence in terms of Vasthu is not wise thought. Experts opinion always saves many lives. A small shop perhaps employs one or two people, whereas a big factory would employ far more people depending upon the size. As such the prosperity of the workers whether one or many is dependent on successful running of the plant in the competitive environment in which we live in. profitably. Profit does not mean merely more production. It means increasing the productivity of the total enterprise. Some of the ratios in this regards are output against capital employed, output per direct worker employed, ratio of direct and indirect workforce etc define productivity adequately. Details such as Compound Wall, guest rooms, guard room etc should be carefully analyzed and properly constructed in the factory as per vaastu shastra principles. One of the often neglected detail in the factories is placement of doors for movement of men and material. It is important to know that movement of men and material produces tremendous energy – good if the doors are in exalted position and bad if they are in debilitating positions. A competent Vastu Specialist would study the directions such as East, West, North and South as also Northeast, Southeast, Southwest and Northwest (Northwest facing house vastu) and central point (Brahmasthan) and guide you so that pit falls could be avoided even in the beginning itself. A running factory has to face problems with labour, local administration such as municipality, inspector of factories, pollution control board and labor inspector etc. Further taxation problems with sales tax, excise tax, income tax and the like are also to be attended. One cannot escape this eventuality. In addition constant problems with suppliers and buyers are part of routine. A factory constructed on sound Vastu principles blesses you with a positive platform to face these things cheerfully and successfully. This would automatically release you from avoidable worries and thus you have time to think of growth and expansion and of new ventures. The manufacturing enterprises either big or small are far too numerous. If a significant portion of them if not, all of them adhere to the vaastu principles in their endeavor they will be free from avoidable and wasteful expenditure of time and money. Thus there will be less worry on running the plant. Now thus they can think successfully about the future, development and growth. Now a days many people are aware of the utility of the vastu shastra. Sadly there are as many quacks posing as vastu scholars and vasthu pundits, giving charms, tavez, hanging coconuts, placement of laughing Buddha and the like and many gullible people have become victims of such imposters and ruin themselves. It is not adequate that one should merely admire and accept vaasthu principles. It is equally necessary to consult a renowned vasthu scholar so that we escape these fake persons. These substitutes are no answer to bad vaastu, because vastu is real and the substitutes are only palliatives which don’t solve the main problem and on the other hand they will successfully ruin the enterprise. Let not your effort in expanding the enterprise be a victim to unknown pranksters. A quack is usually suave, well mannered in presentation and will easily attract a gullible individual and often quote an attractive fee as a bait. Its also true that a knowledgeable vaastu expert may talk less and think more and insist upon seeing the premises by himself and evaluate the true potential of the same. Don’t avoid this step for this is an essential ingredient even for you to evaluate the worth of the person and make you decide whether you can go with him or abandon him. In general, an expert vastu consultant would be costlier. It may be worth paying more and getting right advises similar to consulting an expert doctor as against a fresher. It is often difficult at the first instance to confirm whether the person you call is genuine or fake. A genuine vastu consultant would explain to you all the principles of the vastu shastra to the extent possible across the phone call conversation and leave the choice to you to call him again. Invariably a fake, when contacted, would ensure that he will put you in his grip by calling back and giving various type of assurances and certificates etc. Generally, a talk of reasonable length should convince you of the worth of the consultant. A genuine consultant would not like to spread charm and win you over. He may be brief and to the point. The evaluation of the consultant and the consequences are solely yours. Hence try to contact a vastu specialist having good references and reviews on his services. When an enterprise is established it ensures direct employment to some people and indirect employment to many others. Thus its contribution to the social quotient is vastly different for it not only fulfills your dream but also makes others dream for better life. As such a right decision at the correct time on your part goes a long way in fulfilling these social obligations. This being so we strongly urge that you invest a little more time in consulting a proper vastu pandit. This investment is well worth. We have seen several people ruining themselves in pursuit of saving expenditure that would be incurred by way of fee and convenience charges to an expert vastu specialist. We know an instance where one Subramanyam (Name changed) in Bangalore city picked up elementary vastu knowledge by reading vastu books and going through internet vastu content and felt that he is proficient to administer vastu principles to his enterprise. Believe us or not an investment of over two crore Indian currency in a rented property has become a wasteful expenditure. All due to self-medication. What otherwise was a useful and prosperous enterprise got ruined merely because of petty mind. If only he has spent a few thousand rupees and sought proper advice from a Vastu Expert, he would have given rational solutions and the enterprise would not have been ruined and he would have escaped consequent mental tortures. This is not an isolated case. Generally there is a confusion regarding genuineness of fee payable to a vastu consultant. Here lies the rub and gullible entrepreneur is deceived. In our view the fee should be in the range of 0.5% to 0.75% of the civil cost of the industry (This excludes obviously the industrial machinery cost). In addition, the vastu specialist is entitled to his travel and accommodation expenses. One should endeavor that the vastu pandit should remain a friend of you for Life. This is possible when you treat him courteously, even though you are paying a fee for his services. Don’t we treat a doctor whom we pay for his or our visit as a friend? There are some basic and elementary requirements for compliance with vastu principles that are to be followed while selecting a site for constructing of a factory. 1. Look at the Site Selection carefully and look around and see for the following features. 2. Is there a river or water body in the nearby. If so where it is. If it is in areas other than Eastern, Northern and Northeast side of the proposed industry avoid such sites. However if on these sites there are already constructions of other establishments adjacent to your proposed premises towards South, Southwest (Southwest facing house vastu) and West directions even though there are water bodies as negating factors this principle can be over looked. However a competent vastu scholar alone can decide this. 3. Is the area plain or undulating or having even slope. If the land is plain it is passable. If the land is sloping and the high points of slope or towards West, Southwest and South the land is exceptionally acceptable. If on the other hand the high point of the land is towards East, Northeast and North the land is not acceptable. 4. If towards the south, southwest and west of your chosen site there are high raise constructions your site is a good bargain. 5. If towards North, East (East facing house vastu) and Northeast constructions if any are few and sparse and such constructions are low in height, there are large stretches of open space water bodies etc this site bodes well. 6. If on the other hand the constructions on South, Southwest and West side of your site are low in height, there are large stretches of vacant land etc and there is a low possibility of this open space getting populated in near future this site is not recommended. 7. Often no single feature alone influences the site. The influencing factors are complex and far too many. 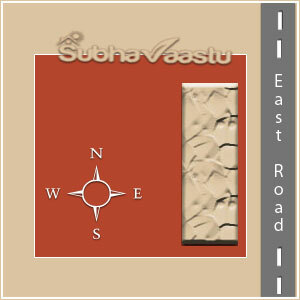 Each should be seen in totality which a specialist vastu consultant alone can comprehend. 8. If the land is undulating, if the undulation can be leveled then this land is acceptable otherwise not. 9. The soil strength should be compatible to the factory requirements. Here we are exposing you to vastu requirements and not the engineering aspects. 10. Though these points appeared to be elementary they are elementary only to a competent vastu scholar and not to all and every layman. Please don’t neglect these aspects it is best to engage a vastu scholar to hold your hand right from the beginning till the factory comes to fruition. We consider the first eight points in the site selection. The last two points namely Earth and Sky will come into play during construction. Every site would have a principle road from which entrance and exit to the main site is possible. 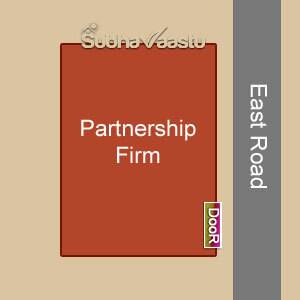 For example when towards East of the plot there is main road such plot is called Eastern Southeast Street Focus plot. 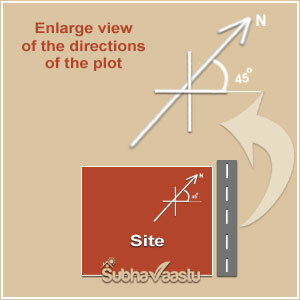 If the main road is towards the West of your site, such plot is called West plot. If at the point of cross roads the plot is there and if the principle directions East, West, North and South are exactly parallel to the 4 sides of the plot then the corner plots in such situations are Northeast plot, Southeast plot, Southwest plot and Northwest plot. To the extent possible try to acquire the Northeast Plots. Next best is Southwest. Avoid Southeast and Northwest plots. If inevitable hire a vaastu specialist and seek his guidance. The ratio of the length and breadth of the plots in variably should not exceed 1 : 1.5. 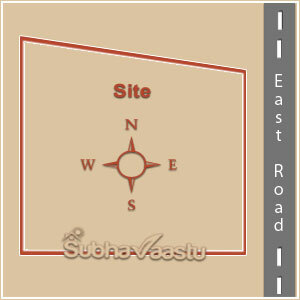 If this ratio is not possible to be adhered to, a vastu expert can help you to Buy correctly. Never have excessive open area within your perimeters, this is ruinous. Often people believe having large open space towards Northeast is good. Here we would quote a proverb – too much good is indeed too bad. The shape of the site is best to be square or rectangular. Curved sites, trapezium, semi circular sites etc are not acceptable. However if such sites alone are available, a vastu expert can handle such situations with proper alternate recommendations. If there are some situations where there are no possibilities to modify such sites to your requirement, at that moment better to avoid such plots. 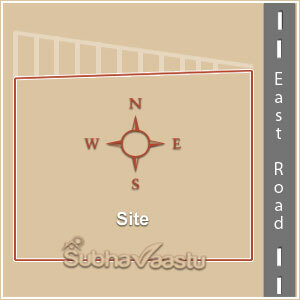 For more information on vastu for sites click this link. This is a regular plot. Where the principal directions are parallel to the four sides of the plot. 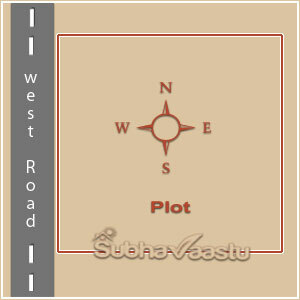 These are generally preferred plots for ease of vastu compliance. This is a observe that the North-South line is at 45 degrees to the side of the plot. In many Court it may vary from "0" to "90" degrees. Where such variations is beyond "15" degrees it is considered as a skewed plot and needs different treatment from vastu point of view. In some cases depending upon the dimensions of the plot the treatment to be treated as a Skewed one will start even when the North-South line is deflected as low as "12" degrees, in some cases it may even be "17" degrees. 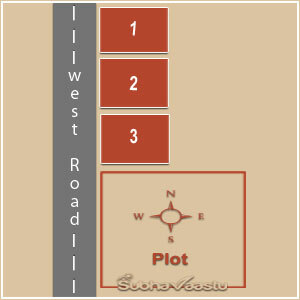 Often the road will not be parallel to principle directions of East, West, North and South (South facing house vastu) in which case the plots on either sides of such roads are called skewed plots. Just as we call East road, West Road, North Road and South Road in case of skewed plots the roads are called Northeast Road, Southeast road, Southwest road and Northwest road. In this sketch given the road is called as Northeast (Northeast facing house vastu) road and plot accordingly is Northeast plot. Similarly when the road is on the other sides the nomenclature of the plot changes. Generally for factories avoid plots on Southeast, Northwest roads and Southwest road plots. However based on the actual site conditions a vastu expert can make suitable amendments to make the plot vastu compliant. Observe this plot. Having West side road, this plot instantly is acceptable for the factory. This is also the West side plot as above, however observe that on the Northeast side there are constructions and Northwest side of the plot is completely open. 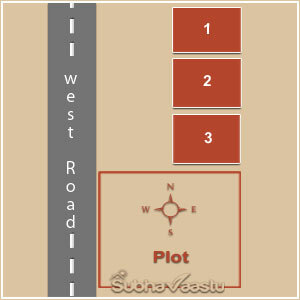 This plot has two defects, Northeast is populated and Northwest open area coupled with the constructions on the Northeast side would cause a street thrust on North-Northwest side of this plot, particularly where the West road is as shown above, such external features are observed by a vastu specialists only. If the construction is at a different position than shown in this sketch the narration would be totally different. Observe this plot, the same constructions are Northwest side of this plot and Northeast is fully open. This gives the advantage of an apparent North Northeast positive powers on the plot. Such minute details go a long way in seeing the suitability or otherwise of the plot, such keen observations are mandatory. This is a plot manufacturing optical fiber components. Observe the plot carefully. This has got Northwest extension and Northeast truncated. From day one the factory was doomed to fail. And it failed. 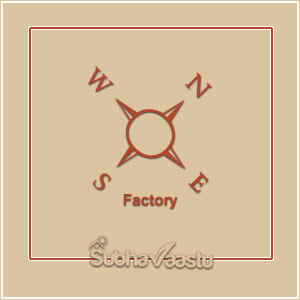 Had the owners consulted a vastu expert, he would have still made this factory a profitable venture. Look at the following plan. The hatched portion of the property is separated from the main portion. While doing so care is taken that the angle at Northeast corner is 90 degrees or preferably less than 90 degrees, say 85 degrees. By so doing you get Northeast visibly extended which favors prosperity of the premises, such delicate points are observed only by a vastu specialist. This is one of the many points that one has to observe. Each plot is unique in its configuration and it is not comparable with any other seemingly similar situations. It is next to impossible to describe every feature exhaustively. It is for this reason that you consult a Vastu Specialist. He observes what you fail to see. Observe the following where a very good construction executed at the wrong placement in the premises has virtually ruined the enterprise. This is a mineral water bottles manufacturing unit in Dubai, United Arab Emirates. Observe the construction carefully, the West side of the plant is extensively open as compared with East direction causing huge losses and loss of name and fame to the company. (For obvious reasons we are unable to disclose the identity of the factory). There will be many such failures in construction of a Factory when an expert is absent while deciding critical parameters at the initial stages. Industries may be either inside a town/city or outside a town/city, when inside a town/city the Neighborhood existing constructions should be factored while constructing once own factory. It is also essential that you should envisage the possible future constructions in the neighborhood. Failure to do so will be costly in course of time. For example, if there is a dilapidated construction in the South or West or Southwest side of your premises and there is no possibility in the foreseeable future that there will be a proper construction here then your factory will be in shambles even from the beginning. Such details have to be carefully examined right in the beginning itself. If it is outside the city limits one has to foresee similar or other factories coming up around your premises and plan your factory keeping that into account. Where ever you are constructing a factory there should not be significant open places in the Southern, Western and Southwestern of your premises. If this is inevitable and if you cannot seek advice of a vastu specialist, avoid that site. The position of main entrance gate to the factory is the next important feature. Usually the main gate is determined by the road facing the factory. If the main gate has to come at Southwest side better to abandon this plot and seek elsewhere. Vastu is an occult science like astrology and numerology, however this is based on empirical observations and scientifically analyzed. It is best to observe these principles right from the beginning itself as corrections of established construction are fraught with huge expenditure. It is futile to question the utility of the vastu science. Either you observe it fully or don’t observe, the choice is yours. It is not that by observing vastu science comprehensively you need not exert for obtaining success in your enterprise. Vaasthu helps you to give a positive platform from where you have an opportunity to fulfill your vision. It is impossible to list out each and every industry that merits vastu application. We can say that every industry irrespective of the products merits vastu service, because industry is meant to produce goods and services to the society and this should be a profitable venture. Vastu Shastra helps you whether you are a handicraft or small scale industry or a multi billion empire. Both of them will have to survive while serving the society. Vastu just does that. Never the less a broad concept of various industries is listed for you to identify the type of vastu service that you may be in need of. Precious Metal Ornament Manufacturing plant. These days several entrepreneurs are entering into mining fields. As can be clear we have no choice with regard to the place of activity. The activity may be towards east side or a river or a lake in which case huge water bodies would be towards the west of the mine on which we have no control. As such while taking to mining activity maximum importance should be given from vastu point of view, to the administrative premises of the mines. Further, the residential premises of the owners would become very critical than otherwise. If these two are taken care of one is care free with regard to mining activities. Often knowing a bit of vastu, people are worried if mining activity has to be taken at a place which is generally considered as vastu non compliant. Vastu for mining industry would have to be treated differently as no vastu pandit has any control on the environment of the mining activity. We have seen of late many firms such as consultancy, trading, business, manufacturing, cine field, chit funds, etc are run by not by one individual. Often people enter into partnership. Such partnerships have to be carefully nurtured to prevent possible conflicts between the partners. In all these cases, it is best to avoid premises of northwest and Southeast direction plots for their operations. For these directions offer every possibility of generating a conflict. One example can be stated here, if the premises has exact southeast entrance or east-southeast entrance then conflicts are bound to come which may even become unmanageable. Similarly, if the operations are in a place where entrance is exact Northwest or north-northwest, apart from the above instability in the business enterprise itself is indicated. This would lead to avoidable conflicts. What is explained here one aspect which inhibits the growth of the enterprise. There are many other features which have to be examined in each case so that the premises are vastu compliant thus aiding a profitable venture. As vastu is supposed to be an occult science people under rate the importance of the same. But a genuine vastu scholar is a great asset from the beginning. Treating him appropriately as a professional (such as a specialist doctor) is an essential requirement in obtaining proper results from him. When you have invited say a kidney specialist his fees obviously is far more than a generalist. But it is essential in the specific case. Same is the case with a vastu consultant. Treating vastu consultancy as a compliance of tradition is unfortunate. When treated as a professional by honouring him as such, you are preventing a possible disaster or misadventure. Kindly do not belittle this advice. 1. United Arab Emirates. (Dubai, Sharjah, Abu Dhabi, Ras Al-Khaimah). What are the detrimental vastu effects? Water bodies at Southwest direction is good? Balcony vastu, which place is suitable for balcony? Is vastu literature available in languages other than English? Where should be the staircase in a house as per vastu shastra? Where should be the car garage, in which direction it is preferred? Dear Sir, firstly I would like to appreciate your honest services to society. i observed many links in this website, it has extreme vastu knowledge content and its a free ocean to learn many things, i was never been obstructed any where in this website while browsing, stunned by seeing the website without any advertisements, salute to your generosity, i am also having one website which contains very lesser pages and content, I know the pains in maintaining the website and keeping it online forever without revenue. coming to the point, i planned to start second factory which the industrial plot layout has water body towards south direction, and land elevation at northeast, before buying some of the local people warns me should not buy that factory, later i browse internet to know about industrial plot layout positions and sheds and landed to your site, after reading the content in your site i learnt that factory is not safe to buy, just 3 days back I investigated thoroughly about owners life with that factory, they incurred huge financial losses. content in this website warns me and it saved my life and my family. god bless subhavaastu website. Hi there! I simply would like to give you a huge thumbs up for your great info you have got right here on this post. I am returning to your web site for more soon. I got this web page from my pal who informed me on the topic of this web page and at the moment this time I am visiting this web page and reading very informative posts at this place.